This exciting video brings you all the action Behind The Scenes at the 2002 IFBB Australian Pro Grand Prix and is a ‘must have’ for all Cormier and Dexter Jackson fans. This exciting DVD brings you all the action Behind The Scenes at the 2002 IFBB Australian Pro Grand Prix and is a “must have” for all Cormier and Dexter Jackson fans. Dexter later went on to become the 2008 Mr. Olympia. 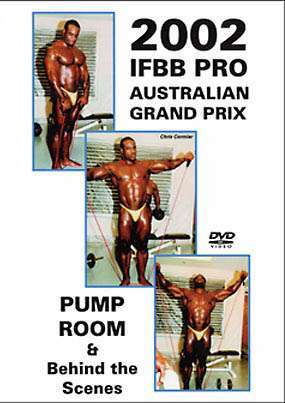 Pump Room & Behind the Scenes Special ReleaseThis exciting DVD brings you all the action Behind The Scenes at the 2002 IFBB Australian Pro Grand Prix and is a “must have” for all Cormier and Dexter Jackson fans. Dexter later went on to become the 2008 Mr. Olympia. From the athletes’ weigh-in and poses with many fun shots, to the athletes’ meeting with lots of closeups as Tony Doherty talks about blowing up the stage for the opening of the show!Then some highlights from the Expo with NICK JONES, STAN McCRARY, GARRETT DOWNING, QUINCY TAYLOR etc., plus 33 sweat filled minutes of the Pump Room action, as the guys get ready at both prejudging and evening finals.